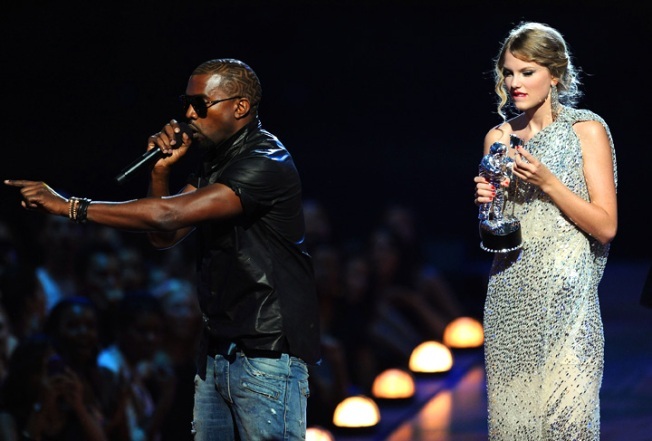 Taylor Swift reacts as Kanye West continues his diatribe after she won an award for Best Female Video. After redefining rude at the MTV Video Music Awards, Kanye West found himself ranked somewhere near Osama bin Laden on the popularity scale. West, who jumped onstage and ripped the microphone away from Taylor Swift right as she was giving her acceptance speech for the best female video, was blasted by everyone from Pink to Donald Trump. The more polite critics called him a jerk, but others did not hold back. In her blog, Kelly Clarkson wondered if West missed out on some hugs as a child. "I mean, I've seen you do some pretty sh---y things, but you just keep amazing me with your tactless, a--hole ways," Clarkson wrote. "It's absolutely fascinating how much I don't like you. I like everyone." Pink tweeted that West is "the biggest piece of s--t on earth. Katy Perry wrote on her twitter page that is was like West "stepped on a kitten." "American Idol" star Adam Lambert said, "Kanye needs to chill. He freaks out every year." Lambert had a point. But usually, West's tantrums are triggered by his own perceived snubs, such as at past VMAs, Grammys and American Music Awards at which he felt dissed when someone else won. Sunday night marked the first time he behaved like an idiot on someone else's behalf. Miffed that Swift's "You Belong with Me" had edged out Beyonce's "Single Ladies," West jumped onstage and took the microphone out of the 19-year-old Swift's hands. "Taylor, I'm really happy for you, and I'm gonna let you finish, but Beyonce had one of the best videos of all time," West said, as a shocked Swift stood by and the crowd booed West. Donald Trump called West's antics "disgusting," and told TMZ he would like to see a boycott of West. The patriarch of the Jacksons agreed. "I don't know what he was doing, he jumped up on stage and snatched that microphone out of that poor girl's hand," said Joe Jackson. "They should blackball him out of show business for that. He just leapt up there, that was bad." West, who was reportedly drinking cognac before his shocking outburst, did apologize shortly after the event using all caps, either to underscore his point or to prove that he could still be painfully annoying. "I'M SOOOOO SORRY TO TAYLOR SWIFT AND HER FANS AND HER MOM," West tweeted. "I SPOKE TO HER MOTHER RIGHT AFTER AND SHE SAID THE SAME THING MY MOTHER WOULD'VE SAID. SHE IS VERY TALENTED!" He issued a second apology Monday, saying he felt like Ben Stiller's goofball character in "Meet the Parents" after his onstage gaffe. "I feel like Ben Stiller in 'Meet the Parents' when he messed up everything and Robert de Niro asked him to leave," West wrote on his blog. "That was Taylor's moment and I had no right in any way to take it from her. I am truly sorry."